Pool C Provides a couple of rematches from 2017. Of course, the headliner is the matchup between Seattle Riot and Atlanta Ozone, a pairing that gave us the most shocking women’s division result in recent memory. Columbus Rival and Minneapolis Pop were in the same pool last year, too, though Rival is the higher seeded team this time around. While the two teams at the top of the pool are the semifinal hopefuls—and one of the most interesting games of the pool play slate—the entire pool provides plenty of storylines and intrigue. It’s been a strange season for the world champions. #3 Seattle Riot attended only one major USAU tournament, Pro-Elite Challenge, which they won. But they’ve played a minimal number of games against the top east coasts teams. They lost to Fury on Saturday of Bay Area Invite and also suffered a surprising defeat to Vancouver Traffic on the same day. But they were without player of the year candidate Alyssa Weatherford and Claire Trop for both of those games as well. Otherwise, Riot has been as successful as you’d expect this season—they’re 5-2 against Fury and Molly Brown on the year, including WUCC–they just haven’t attended any Triple Crown tournaments. They’re as talented as ever and there’s no reason that they can’t win a title. Still, the narrative for Riot remains the same. They have to prove that they can get it done at Club Championships. Last year, their campaign to break their Nationals curse come up shorter than usual, when they lost in quarters to Atlanta Ozone. The rematch between the two in pool play adds some extra intrigue, but it would be a surprise to see Riot not win the pool or not get back to semis. Riot’s reputation for finding new ways to not succeed at Nationals is an unavoidable part of their story. But oftentimes the perception of their inability to win is overstated. Their dominant run to a world championship this summer proved they’re just as capable of winning a title as anyone when they play their best at the right moments. It should be stated, though, that Riot will be without one of the key pieces of their world championship campaign. Sarah Griffith is now on San Francisco Fury, which makes the potential semifinal matchup between the two rivals all the more intriguing. Riot are hardly lacking in championship quality talent, but if they are to finally break their title drought this season, it’ll be without one of the most influential players of their recent efforts to attain that elusive championship. #7 Atlanta Ozone hasn’t had the season they’d hoped for, but they appear to be hitting their stride at the right time. They battled injuries all season long, but finally got their full roster together for Regionals, where they looked like a much more dangerous unit. Ozone, of course, knocked off Riot at Nationals last year, in what was arguably the biggest story of the entire season. They were unable to follow that win up with a worthy encore over the course of this season. Now that they’re back at full strength, they’ll hope to put together that sequel performance in the pressure-packed Nationals environment. Still, Ozone is a long shot to pull off a repeat performance of their run to the semifinal round in 2017. And that isn’t a knock on them, necessarily. The problem for Ozone is that their no. 6 seeding leaves them with a very tough schedule just to make quarterfinals this year. While they’ll be buoyed by their upset win in quarters last year, it’s difficult to project them beating Riot again in pool play. Assuming the finish second in Pool C, that will leave Ozone with a tough matchup against whichever team finishes third in the pool of death that is Pool B. Every one of their potential matchups in prequarters3 poses a serious upset threat. If they do win manage to win that prequarters game, they would be a formidable foe for the winner of Pool D, so a return to semis is doable. Their road to getting to that spot though, will be tough. But Ozone is playing their best ultimate of the season. Their offense was lights out at Southeast Regionals, and their zone defense gave some real problems to one of their potential prequarters matchups, Raleigh Phoenix. Atlanta’s injury bug has made them stronger for the end of the season, helping them develop depth and versatility, but being able to truly crack into the top four is a real challenge. The road will arguably be tougher this season than it was a year ago, but after the magic Ozone worked in 2017, it would be foolish to count them out. It’s not often that the no. 10 seed at club nationals has a Player of the Year candidate, but that’s exactly what #11 Columbus Rival have in Sophie Knowles. The young cutter has been a menace this season, particularly in the deep space. 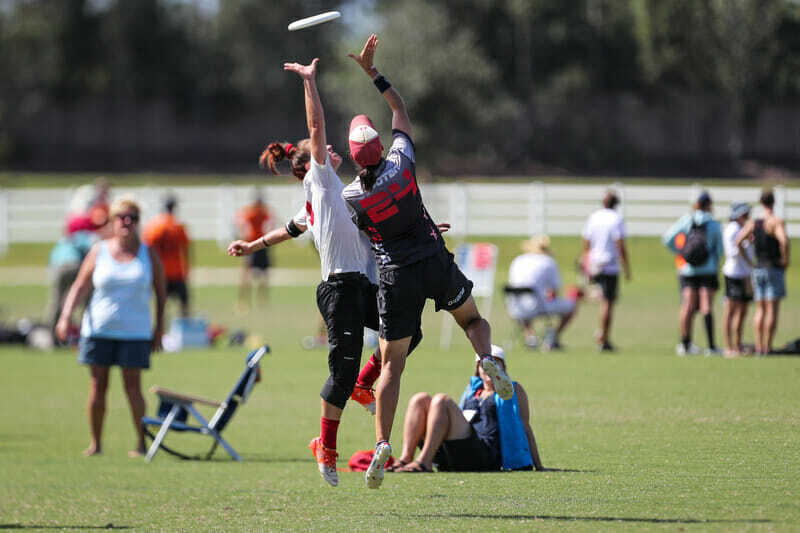 Knowles is one of the most dangerous individual players in women’s ultimate right now and if Rival put together a Cinderella run this weekend, it’ll almost certainly be because Knowles turns in a transcendent performance. When Rival has struggled this season it’s been because they haven’t been able to get consistent play from elsewhere on the roster. Offensive struggles and execution errors contributed to rough showings at Pro-Elite Challenge and U.S. Open. But Rival demonstrated major improvement at the Elite-Select Challenge, where they knocked off 6ixers, played Phoenix as well as anyone, and dominated Madison Heist. Rival are 9-2 in their last 11, with losses to Phoenix and Chicago Nemesis at Great Lakes Regionals, after starting 5-9 through their first two tournaments. The level of competition in their final two tournaments was significantly lower than it was at ESC and U.S. Open, so Nationals will offer a chance to see what the team’s true capability. Are they one of the better second tier teams in the division, as indicated by their seed and results from the latter-half of the season? Or are they a team too reliant on one great player that will struggle for consistent, clean performances against Nationals-level competition? If they are to prove themselves the former, they’ll need a strong showing from Knowles and consistency from her teammates as well. After making Nationals their first three years as a club, #15 Minneapolis Pop ended a six-year absence from the postseason’s final tournament in 2017. They ended up finishing 14th after starting as the no. 11 seed last year and then took a slight step back this season after losing their two assist leaders in Anna Reed and Holly Denecour. They’ve had some younger players step up, like Emma Piorier, who’s putting together a solid Breakout Player of the Year campaign, but they haven’t quite been able to hit the heights they found a season ago. Still, Minnesota returned to Nationals and have a decent enough chance of returning to prequarters too. They’re 1-1 this year against Rival and the rubber match will likely determine which teams makes the bracket. And to be fair to Pop, they were just a few points away from a more impressive season than they ended up putting together. They suffered one point losses against Nemesis, Ozone, Phoenix, 6ixers, and Heist. A close defeat is still a defeat, but their ability to stay in games until the end with teams seeded above them bodes well for their chances in San Diego. They have to find a way to win those games, of course, but their experience in tight games and their earlier win over Rival help to make Pop feel like a good candidate to break seed and make the bracket. Comments on "Club Championships 2018: Pool C Preview (Women’s)"